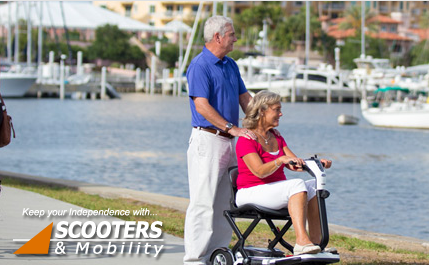 Scooters & Mobility have been established in the Tweed Heads area for nearly 20years. The owners, Mark & Marion, aim to provide a better way of life for their customer by supplying the highest quality range of mobility equipment. This equipment can be mobility scooters, power chairs, wheelie walkers, wheelchairs, bathroom and toilet aids, lift/recline electric chairs. Special orders are attended to with ease. By stocking the leading brands such as Merits, Pride, Shoprider, Elite, Freedom, and to name but a few, we will be guaranteed to be able to assist you with a long-lasting aid to suit your lifestyle. These brands are all TGA (Therapeutic Goods Association) tested, which means that all of their items have met the strict standard as required by the TGA and the aligned worldwide bodies such as the FDA. The leading brands stocked by Scooters & Mobility are your guarantee of a quality item that will be of great benefit to you not only for today, but for many tomorrows as well. Scooters & Mobility, Tweed Heads South are also agents for Acorn Stair lifts. We pride ourselves on our after-sales service, as our staff is well trained in the fields of mobility equipment repairs and maintenance. It is important to us that you not only have high-quality mobility equipment but that it will be running as smoothly and as safely as possible whilst it is in your use. At Scooters & Mobility we don’t just have customers we have friends for life. Scooters & Mobility stock many scooters from budget to top-of-the-range and state-of-art and you are unlikely to find better prices than ours. We stock only leading brands and quality products that will be of great benefit to you not only for today, but for many tomorrows as well. At Scooters & Mobility we don’t just have customers we have friends for life.